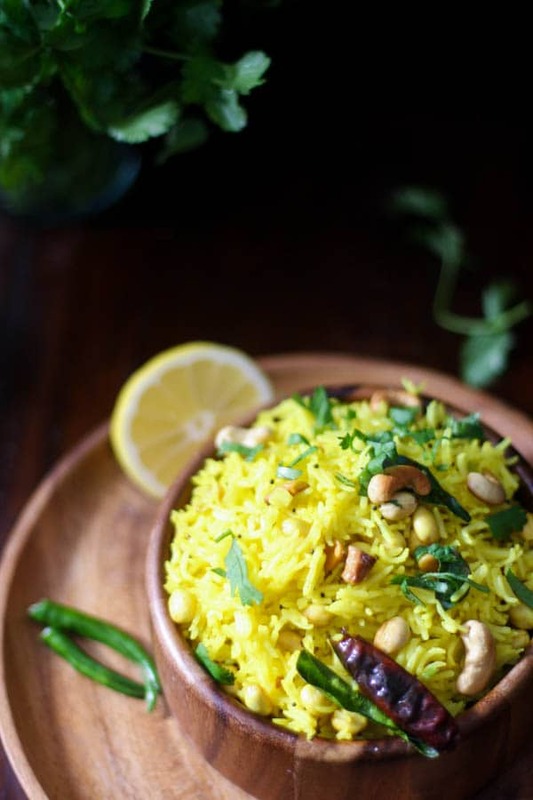 Lemon Rice – South Indian Rice with Lemon and Peanuts, is sort of self-explanatory. However, I am dying to tell you all about it anyway. You see, for all the years I have been blogging, I always shared and posted more technical recipes. Things I wanted to try or things I thought people would love to learn. 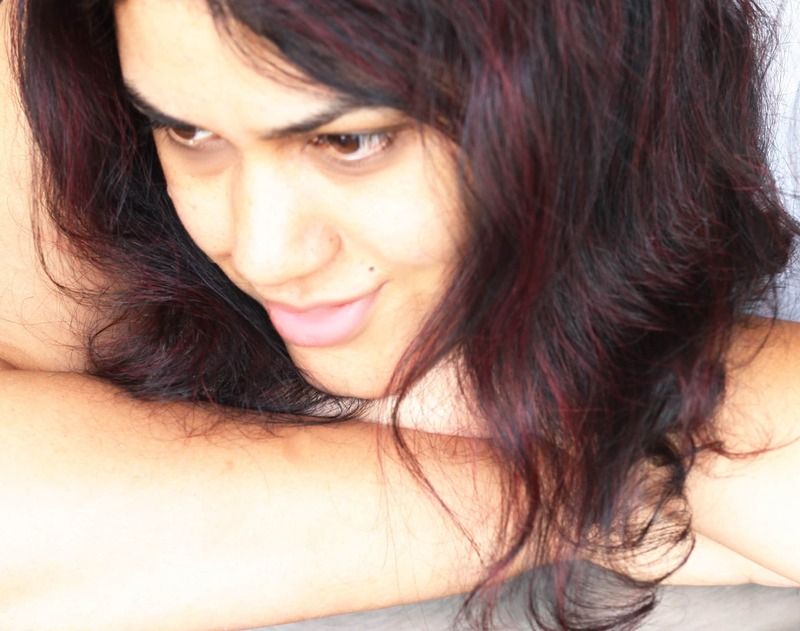 While I shared a croissant recipe because I was so thrilled that I could make those as a home baker, I also shared the Kashmiri dum aalu which is highly technique based for everyone else but a Kashmiri who is used to the cooking techniques. Then I went to culinary school and ultimately started teaching recreational cooking classes. If there is something about teaching I know for sure, it is that you always end up learning a lot more yourself. About you, about the people you are teaching, about the subject you chose to teach. What I learned from teaching cooking classes is that people want to learn the simple stuff as much as they want to learn the highly technical stuff. I know some of my progressive eats blogger friends will tell me that they could have told this to me eons ago. But one must learn when one must learn. And I am a slow learner anyway. Why am I telling you this? 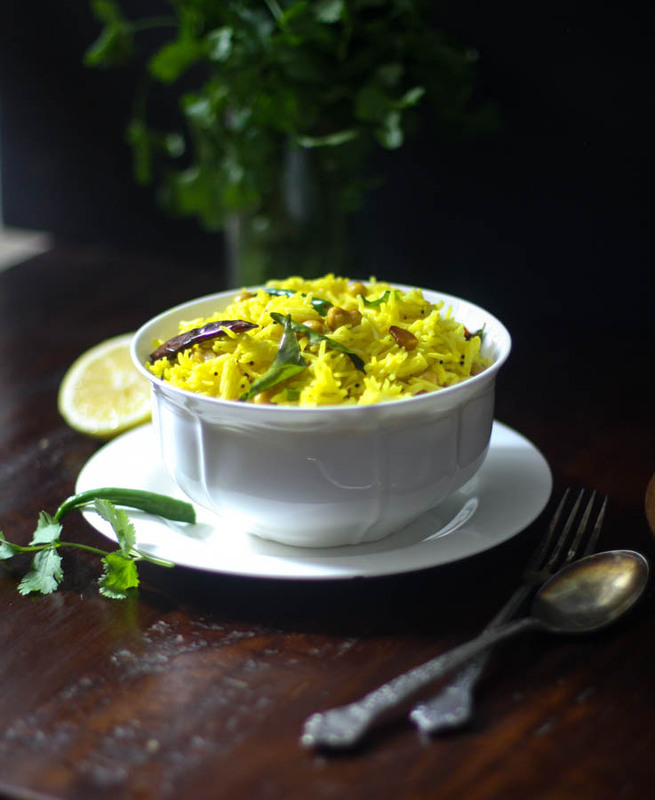 Because I am so thrilled to share this simple, but absolutely flavorful dish of lemon rice with you. 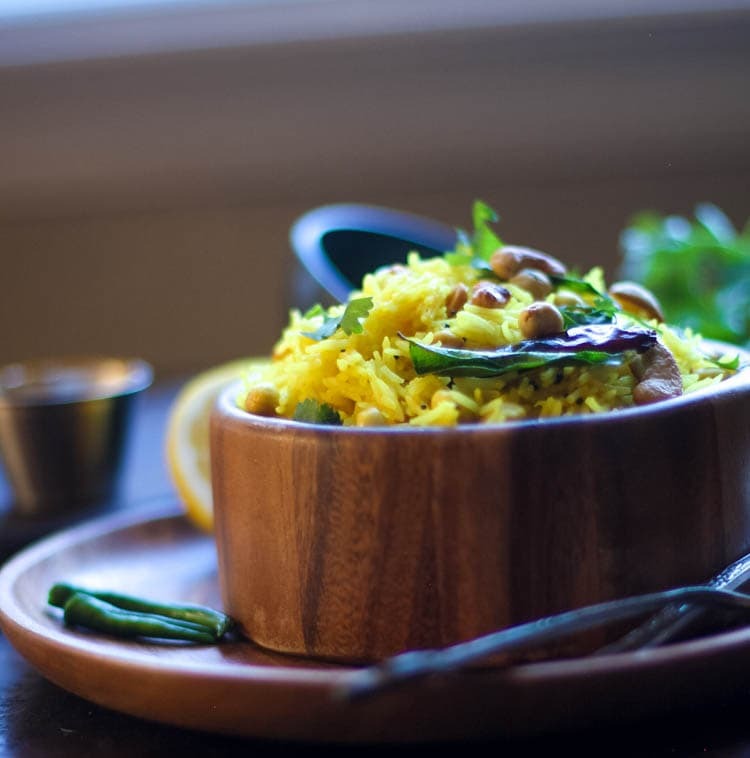 It’s an everyday dish at my home and the whole of South India. 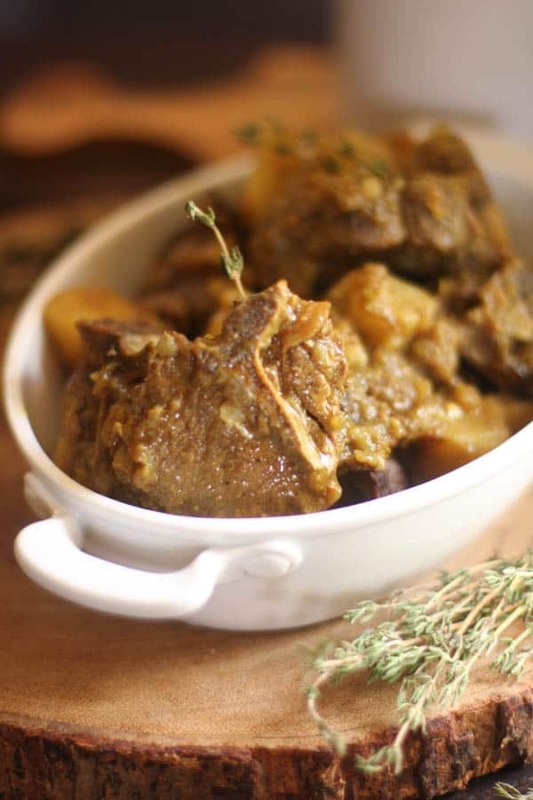 Tempered with curry leaves and mustard seeds with hints of smoky chilli and a nutty crunchy mouthfeel. My teen eats it as is and it was one of the dishes she would take to school in lieu of eating a hot lunch in the cafeteria. For one it didn’t have the Indian food aroma, for which she was teased at school (kids can be mean) hence the preference for hot lunch. The other more important reason was that she absolutely loved the tangy flavor and sunny look of the rice. 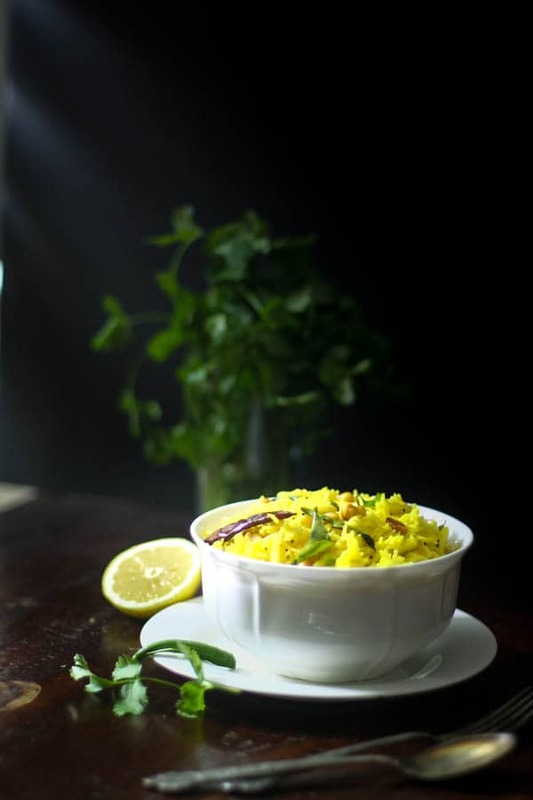 Here is how to make this sunny, beautiful and delicious lemon rice! Rinse the rice under water until the water runs clear. We want to be able to remove as much residual starch as possible. Boil the 2 cups of water and add the rice in when it comes to a rolling boil. Add the salt and the turmeric, stir once or twice. Reduce heat to low, cover the pot and cook the rice for 18 to 20 min. 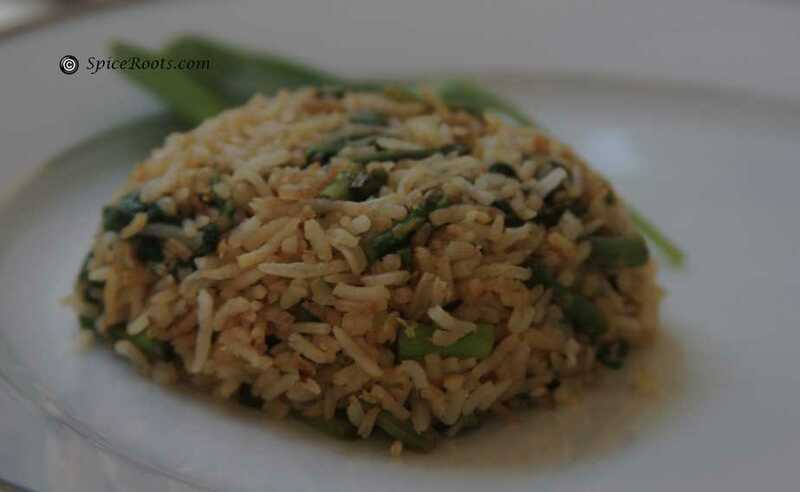 Once the rice is cooked, fluff it with a fork and keep it aside. Heat another saucepan or skillet. Add oil and then add the peanuts and cashews. Saute until golden brown and crunchy. Remove with a slotted spoon and keep aside. In the same oil, add the mustard seeds and wait for them to crackle. Add the curry leaves, green chilis and the dried red chili powder. Saute until the curry leaves turn dark green. Add in two table spoons of water to reduce the temperature of the pan and then add the lemon juice, rice and the nuts. Stir carefully to mix, making sure the rice grains do not break. Switch off the heat and garnish with chopped cilantro. Serve with any chicken dish or a curry. Can also be eaten by itself as a snack. This is my side dish for the #ProgressiveEats group. Our theme this month was Citrus. How wonderful to have something so bright to make the winter days cheerful! Coleen @ The Redhead Baker chose this theme for us! Thanks Coleen! 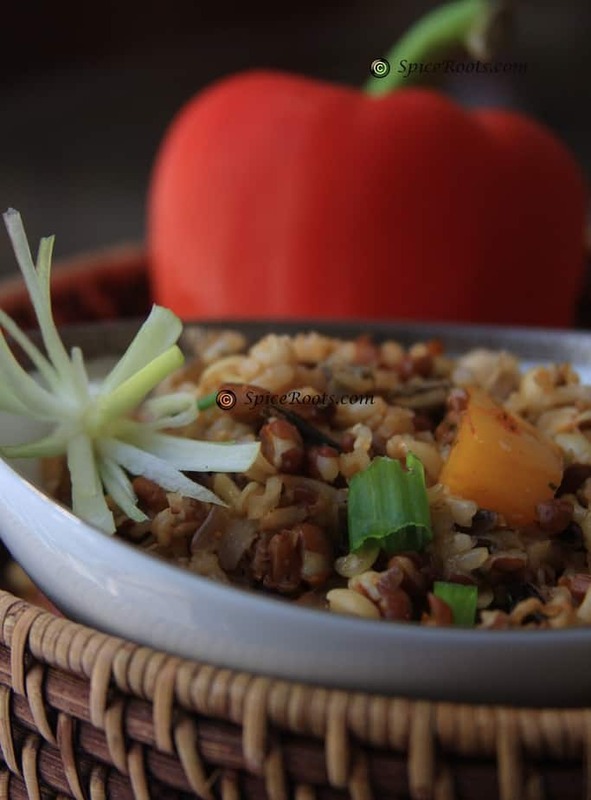 One of my favorite dishes is a simple side dish of Israeli couscous. I sometimes forget to share those type of dishes too but when I do they are always so popular. Great lesson right? I want to make this NOW! Sadly that would mean a trip to the Indian market and a 2 hour trip since I have no curry leaves. Have you ever frozen them? I’m thinking I should do that next time I have a chance to procure some. In the meantime I’m going to punt I want this so bad! Website looks great by the way; such a HUGE improvement! Making it soon, very soon. I realized a few years ago, and it’s still true today, that I haven’t shared most of the basic, go-to recipes that I make on a regular basis (and yes, most of them are simple, but delicious). Your photos are beautiful, wish I had a bowl! I have been *waiting* for this one, Anshie! I am trying to be good with my stupid carbs, so I may try this with cauliflower. Or maybe I’ll just throw caution to the wind and eat actual real rice! I had it one time at an Indian lunch buffet and wanted to eat all of it. And now I can make it myself. The power! Also, I totally understand about posting more technical recipes, because I used to do a lot of that. I still like to focus on technique, but I’m adding some more accessible recipes to the mix these days. And I would never have made fun of your daughter if I was in school with her. I’d have been right next to her wanting to taste everything! Your photos are gorgeous, and it looks so good! Great combination of flavors and textures! Such beautiful photos and a delicious recipe. I DO love easy, flavorful recipes, too. 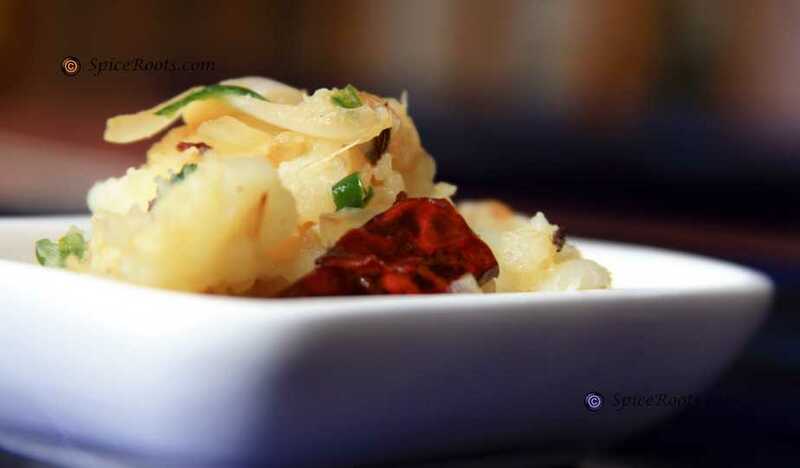 This is one delicious side dish that can be served over and over!